Twice a month on Wednesday night a group of knitters meets at a Borders near me. This time there were three of us. Just some knitting and talking. 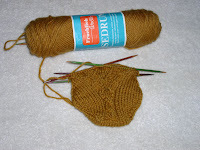 I worked on the mystery socks from Sock knitter Anonymous on Ravelry. These are the September mystery socks and I didn't belong at that time. The pattern is given in the form of one clue a week for four weeks. It took a couple of tries to read the pattern correctly, find the right size needles, etc. I'm doing both toes before moving to clue 2. I've joined an ABC along where you post a picture representing a letter of the alphabet once every2 weeks. 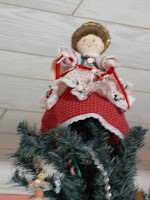 The current letter is A. I present the angel on our Christmas tree. I made her a few years ago. I didn't design her, there was a pattern. I don't remember if it was Vogue or not. This is my last vacation day before going back to work. The Fidget scarf is in its bath. I'll get it dry by putting it on a radiator, so it can go to work with me tomorrow to button shop. I have thousands of buttons at work and they don't have to match for this project. Anyway, I wanted to tell you how wonderful the SWAK vest turned out. I saw the "original" one up close and personal several years ago and quickly decided it would be quite a while before my skills would be up to that particular challenge. 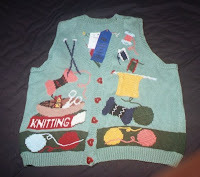 The sweater actually started out as the Knitters vest. DH bought a kit from Patternworks as a Christmas gift and they included the wrong pattern. I'm looking at this wonderful sweater pattern and he's talking about the green yarn being back ordered. He decided that I should have the yarn for the 12 Days of Christmas along with the pattern for the Knitter's Vest. He complained that the sweater was more expensive and I reminded him that it had sleeves, so needed more yarn. The vest got finished quickly.